Argonite is an inert gas mixture of Nitrogen and Argon. Both substances are naturally occurring and present in the atmosphere. Argonite is safer for use in occupied spaces and poses no threat to the environment, because it has no ozone depletion potential and no direct global warming potential. Argonite extinguishes by means of reducing the oxygen content within a room to the point at which a fire can no longer burn, but without compromising the safety of individuals present. IG-55 must be used in total flooding applications where the protected hazard is enclosed, or for protection of equipment that is self-enclosed in order to maintain the agent after discharge. There are no toxicological factors associated with the use of Argonite. Argonite will not decompose or produce any by-products when exposed to a flame from a fire condition. Argonite (N2/Ar) uses IG-55 inert gas as the extinguishing media as specified in NFPA 2001. IG-55 is an inert gas mixture consisting of 50% pure argon and 50% pure nitrogen. IG-55 can be used as a total flooding clean agent fire suppression agent protecting hazards against most flammable substances. 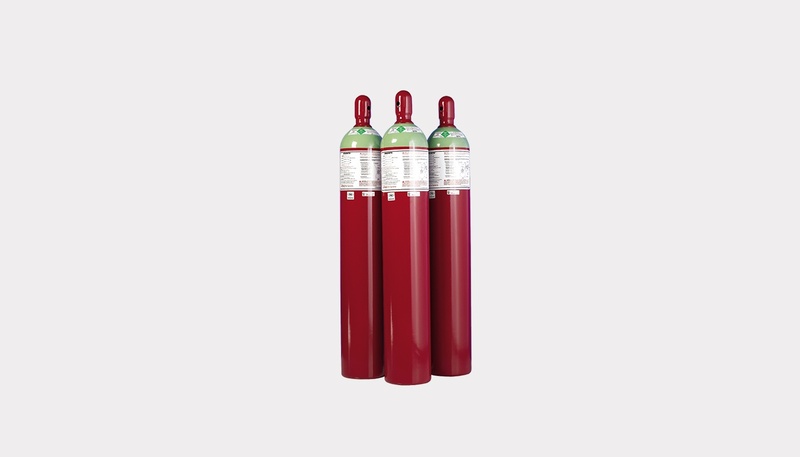 IG-55 is particularly useful where an environmentally acceptable fire extinguishing system is essential, where an electrically non-conductive medium is needed and where people-compatibility is necessary. IG-55 can be used to protect a wide range of applications from sensitive electrical equipment to industrial applications using flammable liquids. Argonite is safe and effective for use on many applications—it is well suited for leaky enclosures such as flight simulators, substations, and control rooms and for applications with multiple hazards. Because IG-55 does not decompose when extinguishing a fire, there are no toxic or corrosive decomposition products created, other than those that may have been released due to the effects of the fire on the materials within the enclosure. Most Argonite systems are designed to extinguish fires with a minimum agent concentration of 37.9% achieved within one minute. This results in extinguishment of the fire and an oxygen concentration of 13%. Argonire is stored as a gas within a cylinder assembly. Thus the cylinders have no dip tubes and can be mounted in either the vertical of horizontal position. Argonite is stored at a pressure of 2900 PSI (200 bar).